Is your RV or Boat Weathered damaged, oxidized, dull, sun-baked? “don’t worry we got you covered". 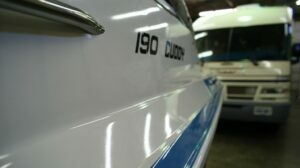 Fiberglass Restoration for your RV, or Boat! WIPE ON! NO BUFFING! SHINE ON is a Restoration Sealer, NOT a wax. 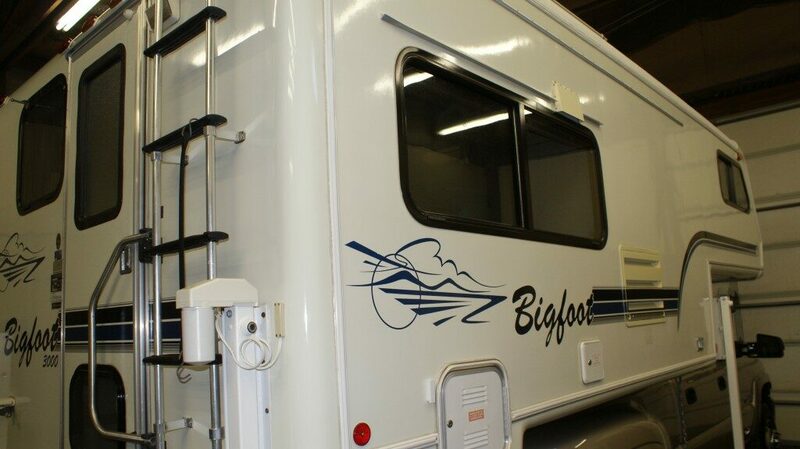 Do you struggle to make your RV or Boat shine with buffers & wax? We can restore the shine no matter how bad it is, without buffing and all the hard work!! Simple & Easy Wipe On Clear Coat! Shine On is a restoration sealer, not a wax, that will provide a superior seal coat shine and protection to gel-coat, fiberglass, and painted aluminum such as on travel trailers and campers. Shine On does not require buffing. The shine is produced as layers are applied. The process is simple and easy. Just clean and scrub the surface with our fiberglass surface cleaner, let the surface dry, then wipe on the clear coat, adding additional coats until you achieve the shine you desire. Cleaning of the fiberglass and gel-coat is the most important part of the process. Shine On will achieve that sprayed on clear coat look without that expensive cost! With Shine On, your RV, Boat and more will resist oxidation and maintain that glossy finish all season long. If you have any questions about our product, we would be more then happy to answer them! Give us a call or email us! We have over 30 years experience restoring and repairing the surfaces of Boats and RV’s. 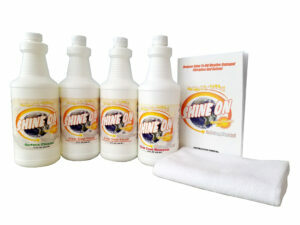 Shine On Will restore your RV' or Boats surface to that factory new look it had when it was new. With just a few simple and easy steps, and half the labor compared to buffing and waxing, you can achieve the results that until now, only the professionals could give. You can achieve the professional look of a sprayed on clear coat, at a fraction of the cost, and have the satisfaction of doing it your self! For RV's Motorhomes and Travel Trailers. For Boats. 2 Kits available for under 30 feet and over 30 feet. Available in Kits for RV/Boat sizes Under 30' and over 30'. Kits Include everything needed including Microfiber towels with instruction booklet. The idea of Shine On has been thought of in many a heads, I’m sure. But for 3 years, the Hansen’s put their heart and soul in to working with a chemist and a manufacturer to develop a product that will do what they say and want it to do! Some of the “musts” were that it not yellow, lasts a long time, has UV protection so as not to continue to oxidize, can be applied without buffing, and that it SHINES like crazy!